Have you heard the great news? After months and months of anticipation and waiting, drivers can finally get their hands on the new 2019 Chevrolet Colorado at Broadway Automotive in Green Bay, Wisconsin! 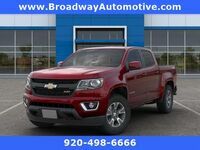 The Chevy Colorado has been one of the most popular truck models in the country as Chevy’s midsize pickup truck model for years, and now the 2019 edition looks to be its best yet! If you’re looking to learn more about the new 2019 Chevy Colorado, you’ve come to the right place! We’re going to break down everything you need to know about the 2019 Colorado for this model research page! We’re going to go over the engine options, capability, technology and safety features of the 2019 Chevy Colorado, right here! Let’s see what’s in store for drivers of the Chevy Colorado in 2019! The 2019 Chevy Colorado comes with three different engines, each with their own unique qualities, for drivers to choose from. First, there’s the 2.5-liter 4-cylinder that offers the best highway fuel economy of any competitive 4-cylinder engine at 26 mpg. Then, there’s the 3.6-liter V6 that offers a best-in-class 308 horsepower and 275 lb-ft of torque. Finally, there’s the Duramax 2.8-liter Turbo-Diesel with best-in-class torque, fuel economy and towing capability! Speaking of capability, let’s see exactly how much the 2019 Colorado can tow with each engine. With the 2.5-liter 4-cylinder, the Colorado can tow up to 3,500 lbs., more than any other competitive 4-cylinder. The 3.6-liter V6 can tow up to 7,000 lbs., also more than any other competitive V6. Finally, the Duramax 2.8-liter Turbo-Diesel offers a best-in-class towing capacity of 7,700 lbs.! Of course, it’s not just about engines and towing, a truck also has to have a little something extra to set it apart! The 2019 Colorado has plenty of that in the way of technology features to enhance the driving experience. Smartphone users can easily integrate their phone into the Colorado’s infotainment system and use the available built-in 4G LTE Wi-Fi on the road! Want to learn more about the 2019 Chevy Colorado? Ready to get behind the wheel of one? Contact our staff at Broadway Automotive for more information or to schedule a test drive today!